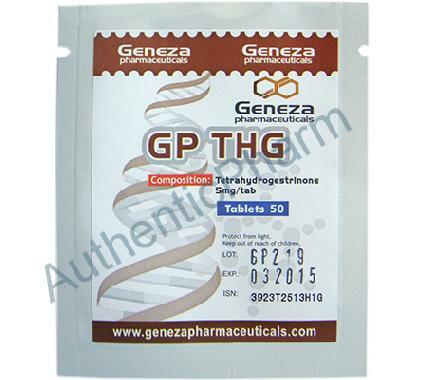 GP THG is an oral product containing 5mg of the steroid Tetrahydrogestrinone per tab. Tetrahydrogestrinone is a steroid that is structually similiar to the popular hormone trenbolone. This compound began gaining popularity due to widespread media attention to doping scandals in Athletics, most known baseball. The compound was nicknamed "The Clear" in the media, due to the fact that it was undectable during drug test, giving back a "clear" result. Until recently, the drug was only available to the most elite athletes, and wasn't on the common market. Structure-activity relationship studies report that the potency of the drug is outstanding, surpassing, on a milligram per milligram basis, every known synthesized or commercial available anabolic steroid at the time of its development. It is a highly potent agonist for the androgen and progesterone receptors, around 10 times more potent than the comparison drugs nandrolone or trenbolone, but with no estrogenic activity. It has been found to bind to the androgen receptor with similar affinity to dihydrotestosterone and produces growth of muscle tissue. Side effects from prolonged use are likely to include infertility in both men and women, as well as other steroid side effects such as acne. Unlike most other anabolic steroids, THG also binds with high affinity to the glucocorticoid receptor, and while this effect may cause additional weight loss, it is also likely to cause extra side effects such as immunosuppression that are not seen with most other steroids. THG is a c17aa oral which means that it can be stressful on the liver. Users of this substance would thus be advised to run some sort of liver protection such as milk thistle or Liv-52 and to try to limit cycles to 6-8 weeks. Like all other anabolic steroids, THG will shut down the body's natural testosterone production. Users would want to run a post cycle therapy protocol after the discontinuing of this substance to get their natural testosterone function back running smoothly. While it isn't known for sure what the normal dosing guidelines were for THG, it is suspected that the doses need to produce desirable results would be small, perhaps in the range of 2-5mg a day. Women would probably want to stay away from THG due to the high possibility of androgen related side effects.